Are you suffering from headaches, sleeplessness and/or a sense of overwhelm? Would you like to rediscover your center and restore your strength? Then you need time at the…. This is a sacred gathering for women to celebrate life as we learn from one another and strengthen ourselves, our families and our community. Take a deep breath. Feel your shoulders relax. Slow down. You have arrived at the red tent. 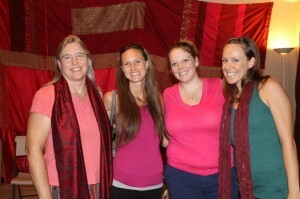 The Red Tent Retreat is a coming together of beautiful feminine souls which have the common bond of being women. We learn from one another, we laugh with one another, we take time to just be. It is a place to incubate, dream and slow down without an agenda or plan. Much is waiting for us in this space of not knowing, but we need to make time for the empty space. This overnight event gives you the opportunity to be fully immersed in the Red Tent so you can explore your inner self. Inside the Red Tent is a space for women to share stories, laughter, wisdom and food. We honor our unique cycles in life. We give ourselves time to remember who we are at our very core, to rest in the innermost temple of our own heart. Red Tents reclaim a sacred space in women’s lives that support us to nourish ourselves and take time out of our busy schedules. The inside space is draped in red fabric to symbolize our time away from the ordinary world. Red Tents provide you with a quiet space in which to focus your attention inward. An opportunity to reflect and let go of anything in your life that no longer serves you or things you want to change. There is no agenda. You are free to be yourself. You will have the opportunity to spend time quietly in the Red Tent and may choose to meditate, use the oracle cards, draw, journal, nap or share with other women. Enjoy a foot rub, hand massage or other healing. Bring your sister, mother, daughter, girlfriend or any woman that needs a little Self care. Our retreat runs from Saturday at 3:00pm until Sunday at noon to give you time for rest, renewal and transformation. Come be inspired by other women and share your story. 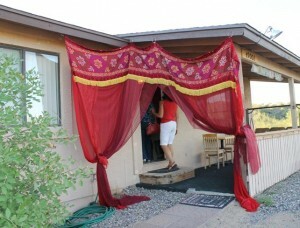 Includes all retreat materials, dorm style lodging with shared beds, meals and ceremony. Cost $195 Space is limited!